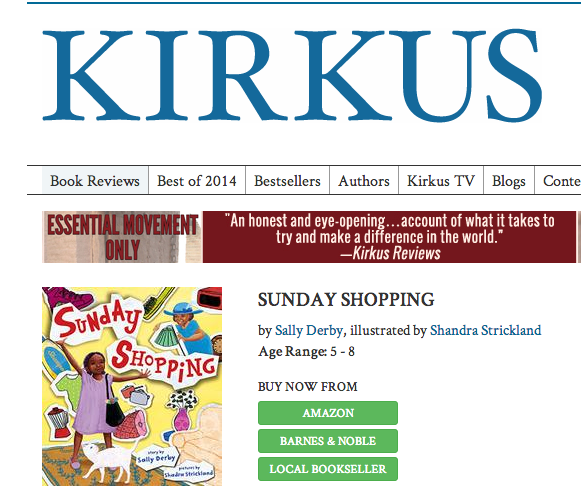 SUNDAY SHOPPING received its first strong review today from Kirkus! “As comfortable as a Sunday afternoon with Grandma, Derby’s picture book sneaks a wee bit of financial literacy into her story of playtime and imagination…Simple phrasing, sparse and easy to read, and charmingly spare watercolor art help create a feeling that is at once realistic and fantastical…Strickland’s playful mix of watercolor, paper cutouts, and collage both engages on its own and supports the story’s theme. Great review! I’m thrilled, but when I look a little closer, I realize it isn’t my work that’s being reviewed, it’s “Shandra” Strickland. I could say this is a small oversight, but come on, it’s an open book test! My name is on the cover, and it ain’t “Shandra”. I am chuckling. It isn’t the end of the world and will hopefully be corrected. But, as most know, mispelling my name is one of my biggest pet peeves, especially when it is sitting right in front of the person writing it. I have politely e-mailed the editor in hopes that this can be avoided in the future.